Whether it be in the USA, Russia, Germany or China: Wherever heads of state are on the move in motorcades, parts from Saxony-Anhalt are riding with them. Because the fascinating shine of the standard holders, the chrome-plated banner mounts on the vehicles, is produced at MWG Manufaktur in Osterwieck in north of the state. “With loving, precise handiwork, our team helps to ensure that the world’s political representatives make flawless appearances,” explains Marian Golub proudly, plant manager of MWG Manufaktur and a galvanising expert for many years. This small factory in Saxony-Anhalt has already been the world leader in this special area for many years. Precise work is needed, and the experienced team carries this out by hand. But whereas the finishes in the big plants in Saxony-Anhalt and the Palatinate are churned out in quantities of up to 20,000 parts per day, the pace at the plant here is more sedate. Here, there is a need for real handiwork. “We make sure of the highest quality and precision in the standard holders, both in the manufacturing and the finishing process,” explains Marian Golub. The finishing process is time-consuming. The parts are ground by hand and then coppered. This layer increases the later shine and the resilience of the coating. After a polishing, the standard holders are nickel-plated and chrome-plated. The galvanisers and grinders responsible for this are a well-practised and adept team, with lots of experience and attention to detail. This is the only way for the holders to meet the high international standard. A total of approximately 2,000 pieces per year are produced. With only around 200 countries globally, this is rather a large quantity, for which Managing Director Trutwin gives a very simple explanation: “Like Mercedes stars, the standards are popular “collector’s items” – which contributes to the increased demand”. MWG Manufaktur does not just specialise in this field, however. Experts in the sheen of classic vehicles are at work here. Lovers of vintage vehicles from all over Germany turn to the professionals in Saxony-Anhalt to re-polish the parts of their beloved treasures. Rusted and dented body parts are reconditioned in Osterwieck and made to shine again. The materials to be enhanced are steel, brass, stainless steel, aluminium, and zinc die-cast. Small batches are also produced here for luxury brands, such as Bentley. Chrome-plated, nickel-plated, coppered or gilded, stainless steel look, titanium look or staining – the individual options for the finest, perfect surface finishes make MWG Manufaktur in Osterwieck a “hidden champion” of Saxony-Anhalt. The partner and director trio of Dr. Katja Loderstedt, Falko Saalfeld and Daniel Trutwin is proud of the MWG Group’s versatility. From the precise finishing of single parts and small batches by hand, to high quantities in three-shift operation, the company covers a wide range of requirements. In the MWG Group, the selection of surface finishes includes anodising, galvanising, powder coating and also the mechanical surface processing of metallic parts. From design development to sample production to system solutions, everything here comes from one source. Almost a century of experience and the innovativeness of the company have enabled the MWG Group to achieve international recognition and market shares. The parts coated in Saxony-Anhalt are in use all over the world. In order to secure its performance, the company makes sure that the employees receive good and continued training. Trainee positions are offered in administrative and technical fields. At MWG Manufaktur in Osterwieck, lovers of vintage vehicles can be trained as surface finishers. Strengthening of the team is an important factor in being prepared for the future. The site here in Saxony-Anhalt offers a high quality of life in a central location in Germany and Europe. The good infrastructure, proximity to some industry giants and the supporting of the companies by the local authorities and state are additional arguments for further investment in the region. Since 2010, MWG Manufaktur, already founded in 1993, and MWG Galvanotec GmbH have belonged to the MWG Group from Wernigerode, located in the west of the German state of Saxony-Anhalt. This group of companies, which dates back to the founding of a galvanic business in 1922, is now active at six sites in an extremely wide variety of different operational areas and has more than 260 employees. “And we are continuing to grow,” emphasises Daniel Trutwin, Managing Partner of MWG Oberflächenveredlung GmbH. For example, only three years ago, the new anodising works of MWG Alutec GmbH was also put into operation in Saxony-Anhalt. “We are a genuine Saxony-Anhaltinian business, one of the few that have expanded Germany-wide starting here,” reports Trutwin. Because in 2015, the MWG Eloxal Landau GmbH in Rhineland-Palatinate became part of the MWG Group. 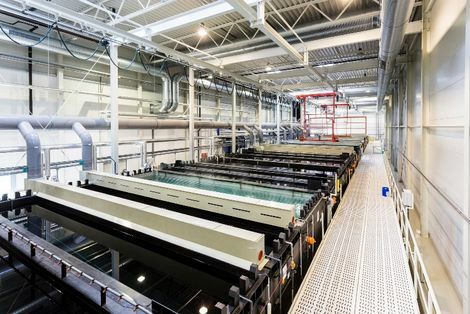 This meant that the total anodising capacities could be expanded to more than 6 million m² per year. The MWG Group is thus one of the biggest anodising contract finishers in Germany. International customers from the most various of industries, including, among others, the automotive and motorbike industry, machine building, agricultural technology, dental technology and even orders from the tattoo industry.